The ballot count in Kenya’s presidential elections has been rigged, says the running mate of Prime Minister Raila Odinga, who is trailing behind his rival, Uhuru Kenyatta. “We have evidence the results we have received have been doctored,” said Raila Odinga’s running mate Kalonzo Musyoka. He said the vote count should be stopped but added that his comments were not a call for protest. Following the latest allegation, the Independent Electoral and Boundaries Commission (IEBC) is holding a closed-door meeting with various high commissioners and ambassadors. The chairman of the IEBC is due to address journalists later on Thursday. More than 1,000 people were killed in the violence which broke out in 2007-08 after Raila Odinga claimed he had been cheated of victory by supporters of President Mwai Kibaki, who is stepping down after two terms in office. Uhuru Kenyatta, who backed Mwai Kibaki, is due to stand trial at the International Criminal Court (ICC) next month, accused of organizing attacks on members of ethnic groups seen as supporters of Raila Odinga. He denies the charges. Kalonzo Musyoka said the failure of the electronic vote transmission system earlier this week had allowed results to be rigged. “We as a coalition take the position the national vote-tallying process lacks integrity and has to be stopped and re-started using primary documents from the polling stations,” he said on Thursday. But Kalonzo Musyoka also called on Kenyans to remain calm. Meanwhile, senior members of Raila Odinga’s coalition have given further details about their allegations, saying that the number of ballots counted exceeded that of votes cast. The long delays, and these new accusations are increasing the tension surrounding the polls. However, until they see comprehensive evidence, many Kenyans will remain skeptical. The latest figures indicate Uhuru Kenyatta has maintained his lead over Raila Odinga, with 2.5 million (53%) votes to 1.9 million (42%) – as originally indicated. However, the new tally shows that the number of rejected ballots, which have become a major bone contention, has sharply come down. In the initial count, some 300,000 votes – about 6% – were disqualified for various reasons. But according to latest official results, this figure has now come down to about 40,000. While the reason for the drop remains unclear, some observers said that election officials were being too strict first time round. Uhuru Kenyatta’s Jubilee coalition has rejected calls for some of these ballots to be included, as requested by Raila Odinga’s allies. The push for these ballots’ inclusion was motivated by a “sinister and suspect logic”, said Charity Ngilu, a senior member of Uhuru Kenyatta’s coalition. The camp also accused the British High Commissioner in Kenya of “canvassing to have rejected votes tallied” in an attempt to deny Uhuru Kenyatta outright victory in Monday’s vote. The UK Foreign Office said claims of British interference were “entirely false and misleading”. 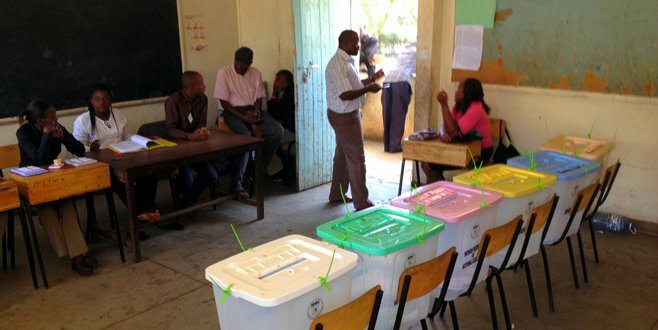 Correspondents say one of the reasons for the many rejected votes is that Kenyans had, for the first time, six ballot papers to fill in, which may have caused confusion. If there is no clear winner, a second round of voting will take place, probably on April 11. From Luo community in western Kenya – 11% of population.